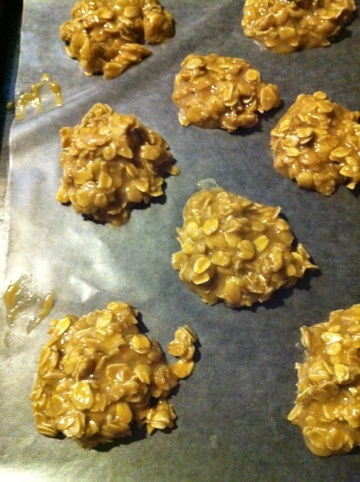 So, bestie & i each made no bakes a week or so apart & neither of our cookies set up well. We each said we were going try again. I told her i thought the key was to boil the butter, milk, cocoa mix longer than the 1 1/2 minutes our recipe said. I was waiting for geoffrey to come home one night & i really wanted something sweet and quick. No bakes. I decided to whip up some no bakes. I started melting the butter, added the sugar & went to get the cocoa and THERE WAS NONE! Ahhhh… Man! What was i going to do. I decided to just keep making them and figured even with out the cocoa they had to be good. I boiled them for 2 minutes this time. They were so delicious!! I think i’m calling them blonde no bakes. It was a flub up that proved to delicious and worth repeating 🙂 thank goodness for mistakes that work out great.